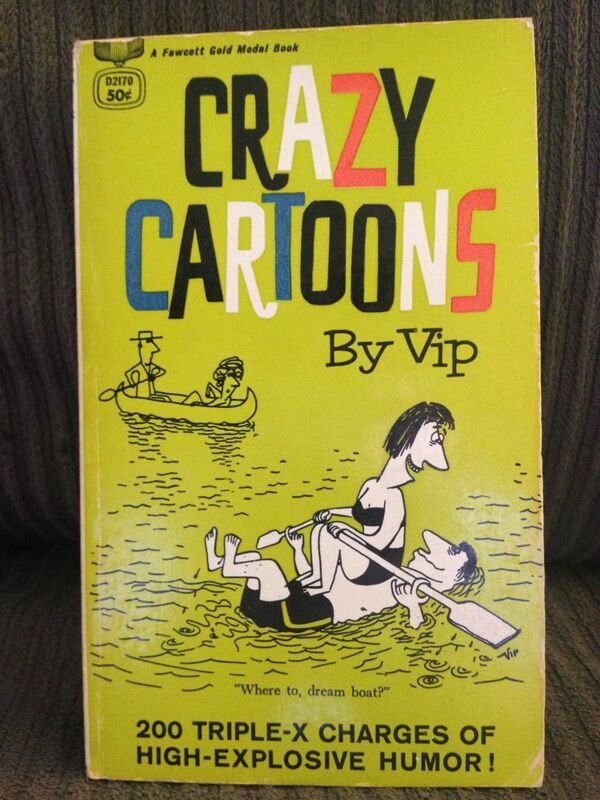 This week we’re looking at Crazy Cartoons by VIP, published by Fawcett Crest in 1956. Cover price is fifty cents, I paid a quarter. Although his style wast instantly recognizable to me the moment I picked this book up, I didn’t know VIP were the initials/pen name for cartoonist Virgil Partch. He was a well-known gag cartoonist throughout the middle of the 20th century, working in magazines and the syndicated comics market for much of his career. Partch’s style was surreal and strange; the tone of his offbeat strips ended up influencing quite a few comic artists up through today. It’s not a big jump to say that a modern gag strips like The Far Side owe a distant debt to VIP’s work. Comics start back up next week! 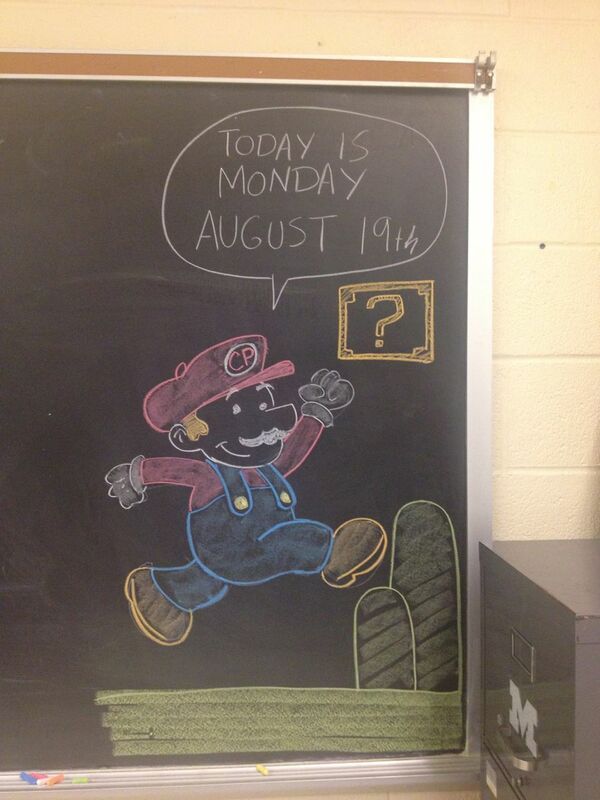 After a long and lengthy debate, I decided to kick off the year with a weeklong tribute to Super Mario Brothers, in all its’ various incarnations… or at least, the ones I enjoyed when I was growing up. I kind of felt like I was drawing the same thing four times this week, but I really liked the way the brick ground ended up looking. On the first Monday of every month, our thrift store marks everything in the store down to half off. During summer vacation, Ellen and I make a point to go to the store first thing on these Monday mornings, so as to have full range of choice in whatever secondhand wares that strike our fancy. Although we’re about out of August now, I thought I’d rundown our last half-off sale of summer 2013. BOOKS – Lover Boy by Stan and Jan Berenstain was one I grabbed because I had already talked about the sequel to this book, Office Lover Boy, in a previous post. Seeing the husband/wife duo behind the wholesome Berenstain Bears work blue was something of a shock back when I wrote that post… and it’s still a little strange to see now! This book’s falling apart but for a quarter, I figured it was worth it. 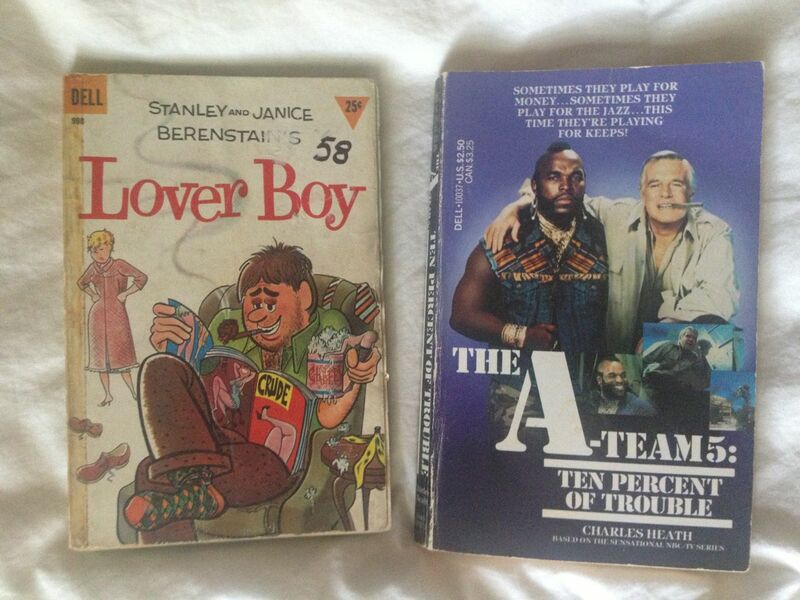 I also found The A-Team 5: Ten Percent of Trouble, the fifth in a series of novelizations adapting episodes of NBC’s 1980’s action series. I collect novelizations when the mood seizes me and… c’mon! Mr. T! George Peppard! The guy who originally played Starbuck on Battlestar Galactica! 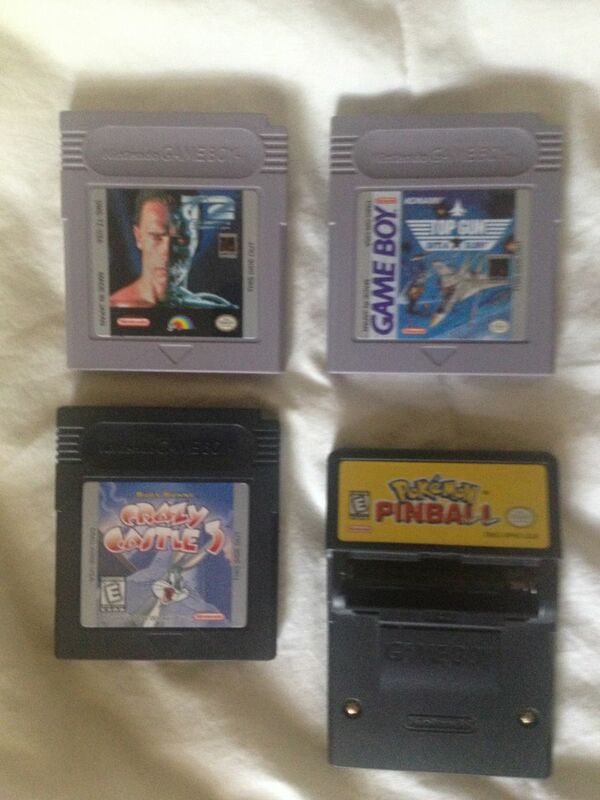 VIDEO GAMES – I picked up four GameBoy cartridges for $2 bucks apiece: Terminator 2: Judgement Day (LJN), Top Gun: Guts & Glory (Konami), Bugs Bunny – Crazy Castle 3 (Kemco), and Pokemon Pinball (Nintendo). This was a mixed bag of carts. I don’t know why I picked up Top Gun; the Nintendo game was awful and this just seems to follow suit. Crazy Castle 3 is fine; it’s just an incredibly boring game. Terminator 2 is (quite surprisingly considering it was published by LJN, purveyors of the worst licensed games ever) the most fun out of all these, however it’s wicked hard. They only give you one life and I can barely make it to the second board without dying. Pokemon Pinball… I haven’t tried yet. I want to wait until I can scrounge a AAA battery for the Rumble Pak. 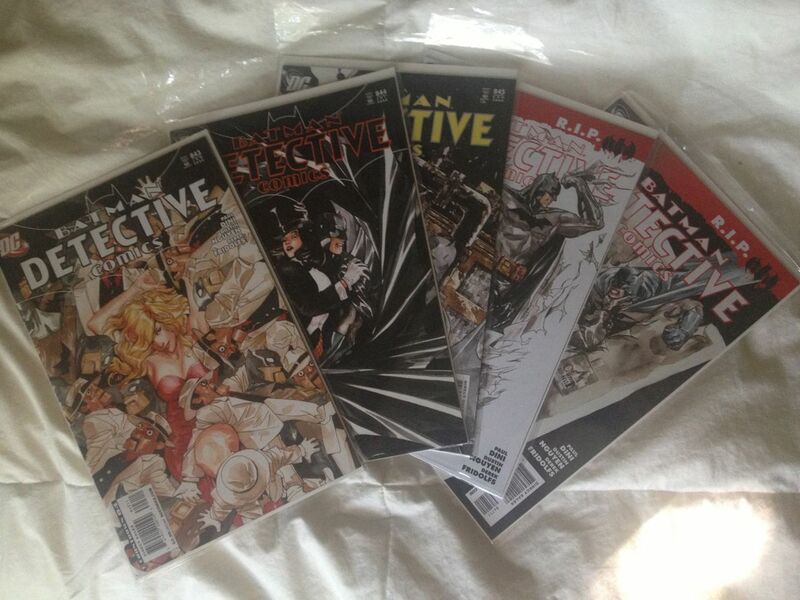 COMICS – Paul Dini’s run on Detective Comics yielded some fun Batman stories but his work was overshadowed at the time by Grant Morrison’s Batman work. I’ve been going back and checking Dini’s Detective Comics’ work and it’s about as solid as you’d expect from one of the main architects of Batman: The Animated Series. The best of these are a two-parter featuring Scarface as the main baddie and a team-up with Zatanna (one of Dini’s favorite DC characters). The next few issues dovetail with Grant Morrison’s Batman R.I.P. storyline. Dini’s stories are aided by Dustin Nguyen’s capable artwork. I got these for fifty cents apiece. 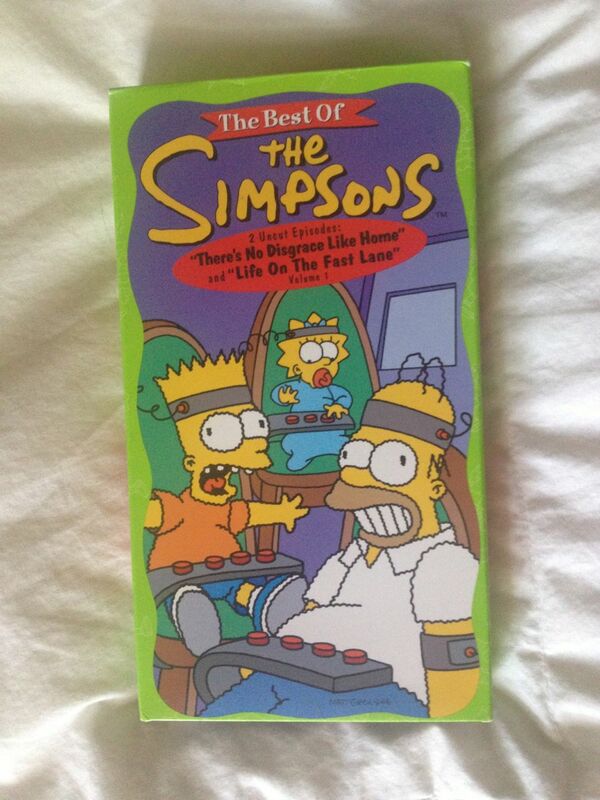 VIDEO CASSETTE – I have the first ten seasons of The Simpsons on DVD and watch them on an endless loop. I probably don’t need a VHS cassette collecting the first two episodes of the first season of the series, which is lucky because despite what the colorful box says, that’s not what I got here. The Best of The Simpsons Volume 1 includes “There’s No Disgrase Like Home” and “Life on the Fast Lane” but the cassette here includes “Bart the General” and “Moaning Lisa.” It’s a weird mistake and a little Googling reveals that the cassette I have is The Best of the Simpsons, Volume 2. You are currently browsing the Teachable Moments blog archives for August, 2013.